Managing Applied Social Research equips you with the skills, strategies, and knowledge you need to effectively manage research projects. Written by a team of nationally-known researchers, this book covers the systematic management of applied social research studies from 'soup to nuts,' providing researchers with an easy-to-follow process and the tools and templates for improving the quality, ethical conduct, and usefulness of the final products. The authors merge expertise adapted from the field of project management with their decades of experience in using established research methodologies and practices to offer readers; practical examples and insights gleaned from major research houses such as Rand, Urban Institute, Mathematica, American Institutes for Research, and others. Key concepts and methodologies are systematically unpacked, with detailed discussion of both theoretical bases and practical applications in the field. Written in plain English, the case studies and vignettes illustrate typical approaches to different scenarios, and the checklists, templates, and other tools provide guides for action. Starting from basic social research strategies, you'll build an understanding of applied research issues and how projects are best managed in a messy, imperfect world. From conceptualization and proposal through implementation, analysis, and reporting, this book helps you lead your projects to success. Social science research is an essential well of information upon which society is run. Proper management is the key to any research project's success, and success becomes more critical in the field given the potential ramifications in terms of policy and its effects on real, everyday people. 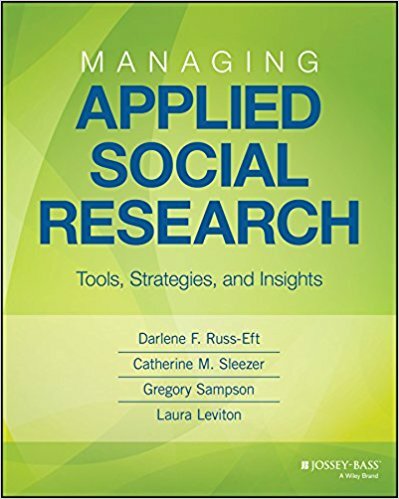 Managing Applied Social Research provides sound guidance and expert insight with an essential real-world focus.